Apologies for earlier problems with the results and thanks to everyone who contacted us! If you didn't get to the race you can still get them by post. For the second year in succession this race was hit by the weather. It didn't seem to bother the competitors however; they ran, enjoyed the Country Fair and afterwards feasted on cakes, despite the downpour at the end. The juniors raced around their courses at a rapid pace with Melanie Hyder (Dallam) showing great promise as she cruised to a very confident first overall in the U14's nearly a minute ahead of the first boy Jos Addison (Helm Hill). Jos had a good race with his team mate Jonathon Knox who finished 3rd. It was good to see 20 competitors in the U12 Boys race with Rory Addison finishing first from James Knox both of Helm Hill. There were only 6 competitors in the U12's girl race in which Robin Goodfellow (Dallam) finished first ahead of Faith Biddle (Dallam). The Senior race was again well supported with 210 starters. The strong winds and slippery conditions slowed some competitors but not Darren Kay, (Horwich) 49.27. He told me he was returning to better his position of 2nd last year with a 1st and that he duly did, cruising to a comfortable victory half a minute in front of his team mate James Logue, 50.05. Competition was fierce for the next few places and Craig Roberts Kendal AC had another great run to finish 3rd and first V40 in a time of 50.17 just ahead of Stewart Gregory (Holme Pierrepont) 4th and 2nd V40 50.25. 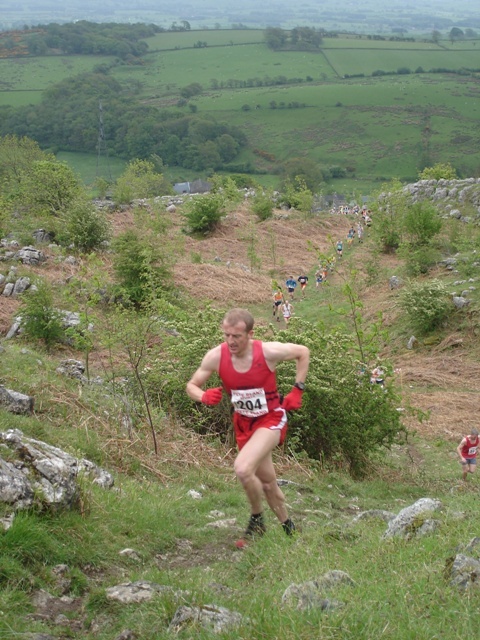 The team event was a narrow victory for Kendal whose runners: Craig Roberts, Paul Dugdale and Matthew Berresford beat Helm Hill by just one point. The Ladies race was won by Rebecca Robinson Kendal AC in 56.19 with Sally Newman (Calder Valley) 57.18 second. The first Ladies team was Radcliffe (Donna Allen-Cartwright, Anna Lupton & Sarah Massey). We could do with more ladies next year. The sudden downpour at the end was a direct hit on our time keepers who fought courageously to complete the last few entries on soggy bits of paper. Special thanks to all race marshals who endured these harsh conditions to ensure everything went smoothly. Once again all enjoyed plenty of cakes to scoff at the end!